When War was declared on August 4th 1914, a local newspaper reported on the mood of the occasion, noting that many events, including the Royal Sutton Coldfield Horse Show, went on as usual on that day. The Horse Show was an annual event, started in 1906 in the last year of Richard Sadler’s mayoralty by the Sutton Coldfield, Erdington and District Horse Show Society, and held in the grounds of Moat House, which belonged to Richard Sadler. Popular horse shows were already being held in other Warwickshire towns in the Edwardian era, Henley-in-Arden, Stratford and Leamington, for example, and so the first Sutton show received good support. In the early years most of the entries in the show were by local owners, and in 1913 trophies were won by Mr. J. Conchar of Wylde Green and Dr. Howard Chavasse of Sutton. There were plenty of trophies, prizes and cups donated by and named after wealthy local men. The Sutton horse show resumed in 1920 after a lapse due to the Great War. Arthur Heaton had purchased Moat House after the death of Richard Sadler in 1917, and Heaton welcomed the horse show back to the grounds of Moat House; it was held on meadow land where Sutton College now stands. By this tenth show in 1920 the organisers were known as the Royal Sutton Coldfield Horse Show Society, and their decision to continue the show was rewarded by the large crowds attracted. In 1923 there were 200 horses entered, and the spectators numbered nearly six thousand. The twenty-second show was duly held on August 8th; the previous year, 1932, the Warwickshire Show had been held in Sutton Park on August Bank Holiday, and the Sutton show was not held, so there was some concern that the 1933 show would be less well supported, but in the event there were 290 entries. Mr. R. G. Gyde of Four Oaks carried off three top trophies in the class for hunting horses, but other winning entries had come from much further away - “Fleetwood Dandy” won the cup for best harness horse, owned by Mrs. Edwin Henriques of Southport. Trophies awarded included the Parkes Silver Challenge Cup, the Newdegate Perpetual Challenge Cup, the Sadler Challenge Cup, the Lawley Challenge Cup, Thomas Ansells Silver Cup, and the Tudor Tankard provided by Dr. Chavasse. The show was well-attended, the sun shone, and the crowd enjoyed “Fun on the ranch”, a display of horsemanship by Two-Gun Rix and his Texas Rangers as well as a less lively demonstration of beekeeping. The Royal Sutton Coldfield Horse Show continued to be held every August until 1939, but it was not revived after World War II. 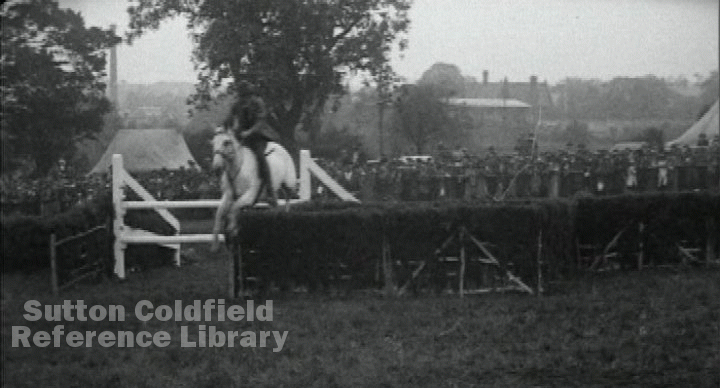 Showjumping at the Royal Sutton Coldfield Horse Show in 1920. The tall chimney in the background was on the Sutton Electricity power station in Riland Road.